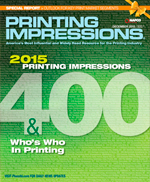 Now in its 32nd Year, the Printing Impressions 400 provides the industry's most comprehensive listing of the leading printing companies in the United States and Canada ranked by annual sales volume. The listings include company name and the location of the headquarters; parent company, if applicable; current and previous year’s rankings; most recent and previous year's fiscal sales; percentage change; primary product specialties; principal officer(s); number of employees and manufacturing plants; as well as the firm's complete range of in-house digital and analog printing process capabilities. The 2015 Printing Impressions 400—our 32nd annual ranking of the largest printers in the United States and Canada based on annual sales volume—was sponsored by Canon Solutions America. Click on the logo to link to more information about its product and service offerings. Financial information for the PI 400 rankings was provided voluntarily by privately held and employee-owned firms, and we did not allow companies that were close to completing a fiscal year to provide projected/estimated sales figures. As a result, printers shown on this list were most often reporting 2014 calendar year revenues as their most recent figures. Despite our repeated attempts, various privately held companies refused to divulge annual revenue figures, so they were not included on the list. A few very large firms that did participate, notably RR Donnelley, would not, or could not, break down annual sales by the various print market specialties that we track (so, they don’t appear on any of the Top 5 charts). Company rankings for the current and previous year are based on sales figures reported to us in 2015. Therefore, printers that revised their previous year's revenue may have changed their ranking compared to where they ranked on last year's Printing Impressions 400. Similarly, the percentage change in sales is calculated based on the most recent sales information provided. Individual printing companies that are part of larger graphic arts networks are not listed separately. In essence, to do so would be to show sales figures twice. Instead, only the revenue of the entire umbrella corporation are included. In the case of a holding company that owns a graphic arts firm, the printing entity is listed in our rankings with the holding company's name and location appearing beneath it. * Privately held Admiral Packaging, which was ranked number 10 on the 2015 Printing Impressions 400, should have been ranked number 130 with most recent fiscal years sales of $38 million. * Privately held Lake County Press, which was ranked number 239 on the 2015 Printing Impressions 400, should have been ranked number 138 with most recent fiscal years sales of $35.30 million.